After day of escalating violence with Gaza, Israel turns its gaze to the northern border after mortar shells land in Israeli territory, prompting IAF to take to the skies and and strike back; while mortar believed to be accidental, Israel says it will not tolerate any kind of fire into its territory. 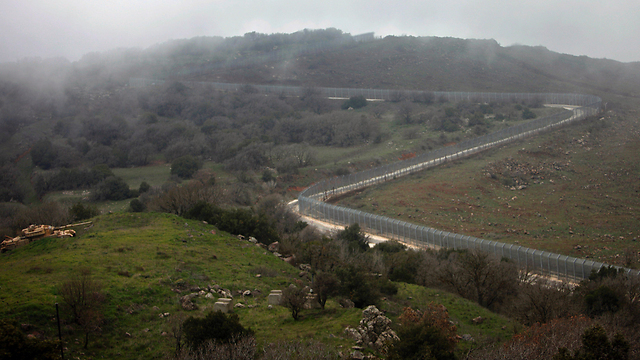 The IDF struck at a mortar launchpad belonging to the Syrian army, located on the Syrian side of the Golan Heights, Monday evening after it identified a mortar which had landed in an open area in Israel’s Golan Heights near the border fence with Syria. The mortar attack is considered to likely be the result of the Syrian civil war rather than a deliberate attack on Israel. The strikes come one day after a marked day of violence sparked by a rocket fired into the Israeli town of Sderot on Sunday afternoon from the Gaza Strip. In retalation, the IDF launched combined artillery and air stike on dozens of Hamas targets in Gaza which continued into the night. Israel's response drew heavy criticism from Turkey despite the Israel-Turkey reconciliation agreement being recently ratified by the Turkish parliament. Israel, in turn, issued its own statement calling on Turkey to "think twice" before telling other countries what to do. Israeli Occupation Forces (IOF) at dawn Monday carried out a large-scale arrest and storming campaign in different locations in the West Bank. Local sources revealed that Israeli troops stormed Azzoun and Jayyous towns east of Qalqilya and broke into four homes amid intensive shooting of flare bombs and conducted search operations. The forces interrogated residents in their homes, the sources added. The IOF soldiers erected barriers along the road leading to Jayyous town where they were deployed in the town’s vicinity and continued combing operations in the area till morning hours. Dozens of Palestinians Monday morning choked on Israeli-fired tear gas while the IOF soldiers arrested a Palestinian man amid clashes and Israeli raids in Salfit city in the northern West Bank. The forces stormed and searched Palestinians’ homes in Salfit city and nearby towns including homes of prisoners in Israeli jails. The forces retreated from the city, but, set up a military checkpoint at its entrance early morning. In al-Khalil, five Palestinian men were rounded up by Israeli troops who stormed the home of the Palestinian writer Lama Khater and handed her a summons for investigation after attempting to arrest her. Two other Palestinians were arrested in Tubas and Ramallah cities whereas the forces stormed the town of Asira al-Qebliya, broke into about 20 Palestinians' homes in the eastern district of the town and intimidated residents. 60 Israeli airstrikes rocked the northern corners of the blockaded Gaza Strip overnight Sunday, resulting in injuries. 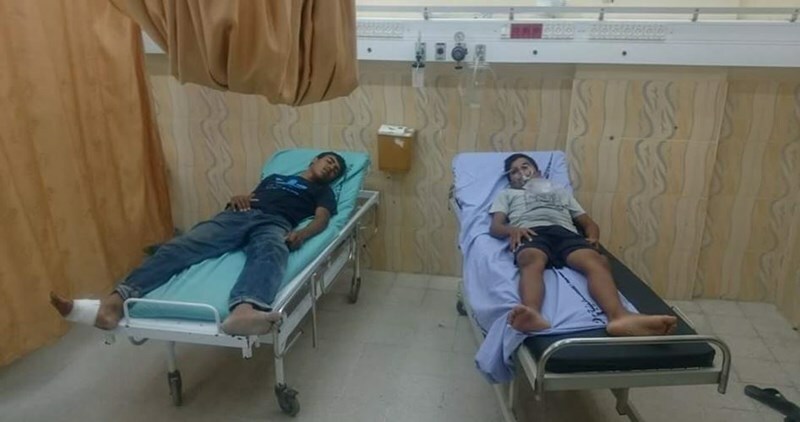 Spokesperson for the Gaza-based Palestinian Health Ministry, Ashraf al-Qudra, said a 17-year-old boy was injured with missile shrapnel in his feet at the same time as a state of traumatic panic overwhelmed three children for fear of being killed in the heavy shelling. 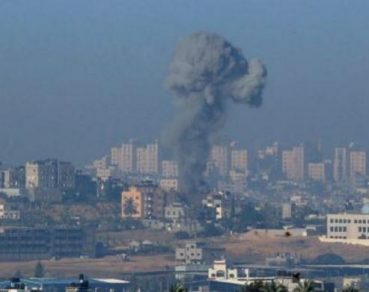 Interior Ministry spokesman Iyad al-Bazm said the Israeli warplanes launched over 60 airstrikes on northern Gaza Strip. The Israeli army further targeted the enclave with heavy shelling. The strikes targeted training sites for the Palestinian resistance groups of Hamas, al-Quds Brigades, the Islamic Jihad, and the Popular Front for the Liberation of Palestine, among others. Sounds of violent explosions were detected in northern Gaza Strip. Remarkable material damage was inflicted on Palestinian lands and infrastructure. Israeli warplanes kept hovering over the territory, signaling the imminent launch of other attacks. The Interior Ministry spokesman added that the security forces and police have been providing the casualties and civilians with the needed assistance. The escalating strikes occurred a few hours after reports were released on an Israeli air raid over Beit Hanoun at around 10 p.m, without immediate details on possible casualties or material damage. Israeli F16 warplanes fired two missiles in Beit Hanoun. 10 artillery shells also rocked the city’s eastern corner moments after. Earlier in the day, spokesman for the Ministry of Health, Ashraf al-Qudra, announced that a young Palestinian man in his twenties was injured in his head as a result of an Israeli artillery shelling targeting a resistance training site in Beit Hanoun. Local sources said three artillery shells fired by the Israeli occupation army targeted an agricultural land in al-Misriyine neighborhood in Beit Hanoun. Furthermore, Israeli artillery shells landed in the Filistin training ground which Hamas fighters use for resistance drills. The missiles were fired minutes after the Israeli army alleged that a rocket was launched from the Gaza Strip and hit the city of Sderot, with no injuries or damage reported by the Israeli army. The Israeli occupation forces have often launched airstrikes at several sites allegedly used by Palestinian resistance groups in the besieged coastal territory in response to rockets fired from the enclave. The Israeli Air Force carried out, Sunday, at least fifty military strikes wounding five Palestinians in different parts of the Gaza Strip, reportedly after a shell was fired earlier from Gaza into an open area in Sderot in the Negev. Two of the targeted areas in the besieged Gaza Strip are said to be camps runs by the al-Qassam Brigades, the armed wing of Hamas. The Israeli strikes also targeted the Agricultural College and farmlands in Beit Hanoun, in the northern part of the Gaza Strip, in addition to hitting two sites run by the Popular Front for the Liberation of Palestine (PFLP), and the al-Quds Brigades, the armed wing of the Islamic Jihad. The army also fired several artillery shells into open areas, and agricultural lands in different parts of the besieged and impoverished coastal region. The Israeli army claimed that it struck Hamas sites in retaliation to shells fired into Sderot, and held Hamas fully responsible for the escalation. The IDF is reported to have continued a combined air and artillery assualt on Hamas targets in Gaza Sunday night in retaliation for rockets fired from the Strip into Sderot earlier on Sunday afternoon. According to the Palestinian report, the strikes were carried out by the Israel Air Force and Israeli artillery units on a Hamas military wing position in Beit Hanoun in the north Gaza Strip, from which the rocket was launched earlier on Sunday afternoon. The report indicates that one of the targets was a military outpost belonging to Hamas’s security apparatus. Moreover, the report claimed that a 17-year-old Palestinian boy was lightly wounded during the retaliatory attacks, along with three other children suffering from shock. The response of the IDF signals a departure from the norm as it usually retaliates once during the hours immediately following the rocket fire or the night after. While the reports were not originally officially verified by the IDF late Sunday night, explosions were heard by residents of Israeli towns bordering the Gaza Strip. Guy, a resident of Sderot said, "There is a feeling of pressure and fear. We hope everything is going to be ok."
Later, the IDF released a statement accounting for the continued attacks: "The IDF attacks are in response to the rocket fire into Israeli territory. The rocket fire constitutes a threat to the security of Israel and a strike against the State of Israel's sovereignty," the statemen read. "The Hamas terror organization is the sovereign power in the Gaza Strip and it is therefore responsible for all terror activities emanating from it." Tensions mounted after a Code Red rocket alert was sounded in Sderot and Sha'ar Hanegev just before 2:30pm on Sunday. 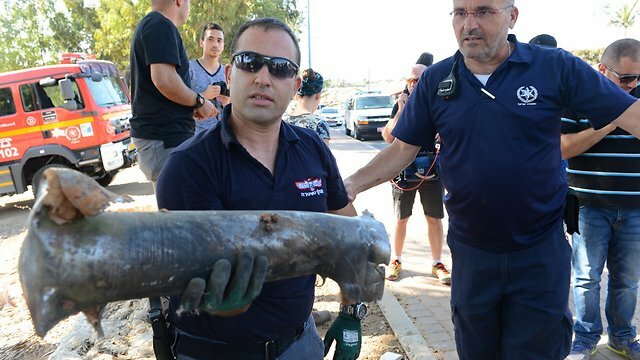 Shortly afterwards, an explosion was heard, and a rocket was found between two residential houses in Sderot. There were no injuries or damage, though forces were immediately dispatched to the area. The Israeli navy on Sunday evening kidnapped two Palestinian fishermen from northern Gaza shores and seized their fishing boat. 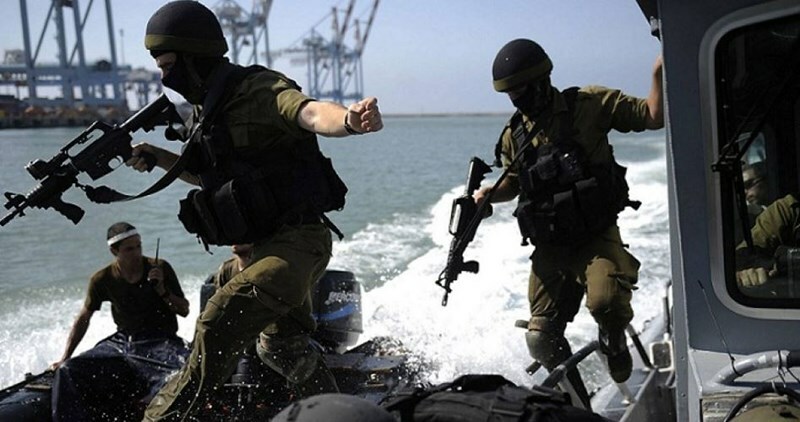 A local committee said the Israeli navy kidnapped the two Palestinian fishermen Sherif Muhammad al-Sultan and Ibrahim Ghaleb al-Sultan before they seized their vessel. 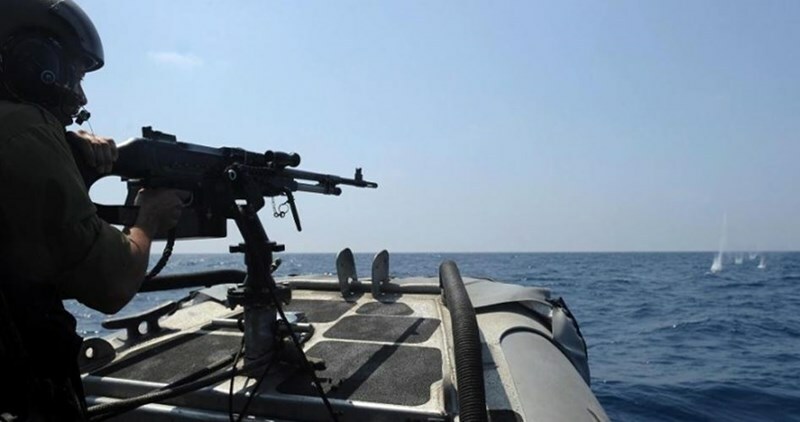 The Israeli gunboats opened heavy machinegun fire on Palestinian fishermen and chased them down before they abducted two fishermen onboard their fishing vessel. Three Palestinians were injured, Sunday, after the Israeli army fired shells targeting a Hamas center, and an empty land, in Beit Hanoun, in the northern part of the Gaza Strip. The army stated it was retaliating to a rocket fired from Gaza. Dr. Ashraf al-Qedra, the spokesperson of the Ministry of Health in Gaza, said three Palestinians were moderately wounded, and were moved to Kamal Adwan Hospital, suffering moderate injuries. The two suffered various cuts and bruises, especially the faces and upper body. The army also fired a missile targeting a water tank and an empty land, in Beit Hanoun, causing damage. The Israeli army said a shell was fired from Gaza into Sderot town, in the Negev, causing property damage. The Israeli Air Force fired missiles into a center run by the al-Qassam Brigades, the armed wing of Hamas, while the army fired a missile into another target. Sunday afternoon, a rocket was fired from the Gaza Strip and landed in Sderot, landing without causing injury between residents' houses; IDF responds in kind. A Code Red rocket alert was sounded in Sderot and Sha'ar Hanegev just before 2:30pm on Sunday. Shortly afterwards, an explosion was heard, and a rocket was found between two residential houses in Sderot. There were no injuries or damage, though forces were immediately dispatched to the area. In response, the Israeli Air Force attacked a Hamas military wing position in Beit Hanoun in the north Gaza Strip, and IDF tanks attacked further terrorist infrastructure. According to Palestinian sources, a 20-year-old man was lightly injured by shrapnel. Palestinians also claimed that IDF tanks fired at a water tower in Beit Hanoun. However, the IDF has yet to confirm these reports. Hamas is evacuating all its outposts and security facilities in the Strip out of fear of further reprisals from Israeli forces. This is standard practice after rockets are fired from Gaza to Israel. The rocket, which was fired from the north of the Gaza Strip, is the third to have been launched since the end of Operation Protective Edge and is the second to have landed in Israel in two months. The Israeli occupation army fired missiles into the northern Gaza Strip town of Beit Hanoun on Sunday afternoon and evening, injuring a Palestinian youth. Reports of an air raid over Beit Hanoun emerged at around 10 p.m, without immediate details on possible casualties or material damage. Israeli F16 warplaneualties. Earlier in the day, spokesman for the Ministry of Health in the blockaded Gaza Strip, Ashraf al-Qudra, announced that a young Palestinian man in his twenties was injured as a result of an Israeli artillery shelling targeting a resistance training site in Beit Hanoun. Local sources said three artillery shells fired by the Israeli occupation army targeted an agricultural land in al-Misriyine neighborhood in Beit Hanoun. Furthermore, Israeli artillery shells landed in the Filistin training ground which Hamas fighters use for resistance drills. The shells were fired minutes after the Israeli army alleged that a rocket was launched from the Gaza Strip and hit the city of Sderot, with no injuries or damage reported by the Israeli army. A Palestinian young man was injured in his face due to Israeli shelling and targeting of different locations in Beit Hanoun town in northern Gaza Strip at noon Sunday. Local sources revealed that the IOF artillery targeted an agricultural land by three shells and Israeli airplanes targeted “Filistin” training site for al-Qassam Brigades in Beit Hanoun. On the other hand, the Israeli 0404 website reported that a rocket fired from Gaza exploded between two houses in Sderot settlement in the northern Gaza Strip. No casualties or damages have been reported. Israeli Occupation Forces (IOF) arrested at dawn on Sunday six Palestinians from the West Bank and Occupied Jerusalem. 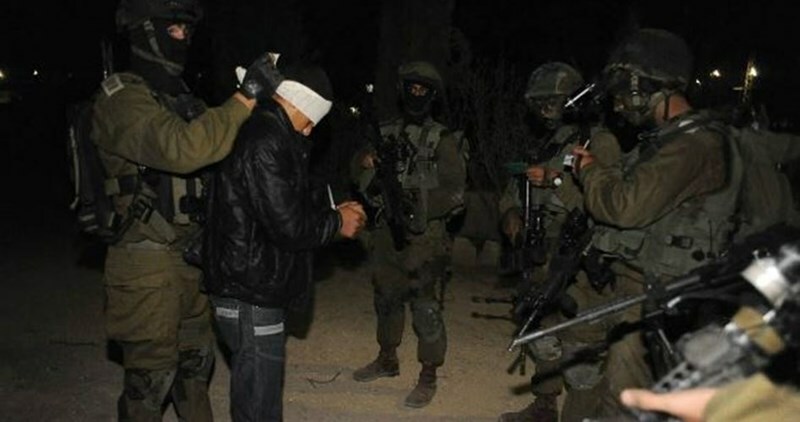 A report issued by Israeli army showed that the arrests affected four Palestinians: a man from Beit Ummar town in northern al-Khalil, two from Ayda and al-Duhaisheh refugee camps near Bethlehem and a Hamas member in al-Fare'a refugee camp near Tubas city. Local sources revealed that clashes erupted with Israeli troops in al-Fare'a camp resulting in the injury of the 24-year-old Palestinian man who was shot by a live bullet in the arm with shrapnel in the chest. He was taken to hospital. The sources also reported that the IOF arrested each of Fayez Sbaih and Luai Sbaih from Hazma town in Occupied Jerusalem. The rest of the arrested were identified as Muath al-Aydi, 28 years old from Fare'a camp, minor Yazan al-Kurdi from Ayda refugee camp, and Husam Ekhlail from Beit Ummar town in al-Khalil. 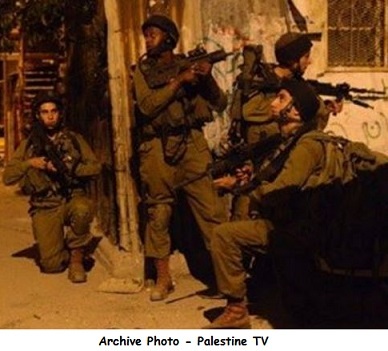 Israeli Occupation Forces (IOF) stormed at dawn on Sunday several towns in Nablus governorate. Eyewitnesses revealed that Israeli patrols raided Eraq Bourin town southwest of Nablus city resulting in clashes with Palestinian inhabitants amid intensive Israeli shooting of tear gas and stun grenades. The forces were stationed in the eastern outskirts of the town then three patrols headed towards the nearby town of Til, Palestinian youths said. 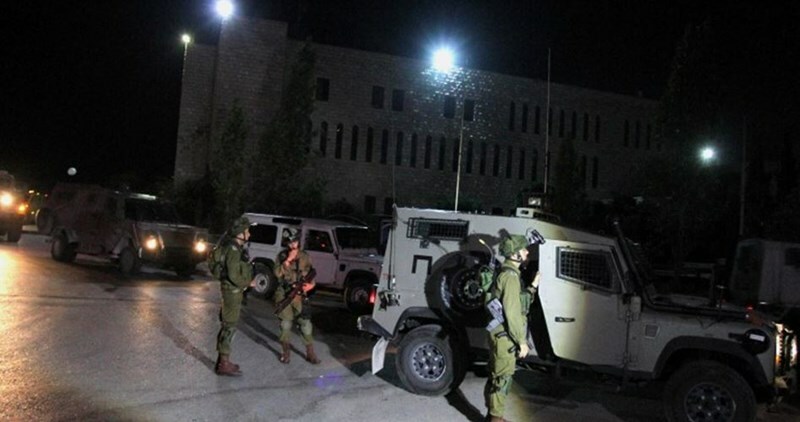 Meanwhile, Israeli forces stormed Bourin town to the south of Nablus and searched Palestinians’ homes while a new storming operation took place in Beit Dajan town in the east of the city a few hours later of the retreat of Israeli troops Saturday evening. The forces besieged the vicinity of the town’s school in addition to the agricultural road near Elon Moreh settlement. The Israeli occupation gunboats on Sunday morning opened heavy machinegun fire on Palestinian fishermen setting sail off Beit Lahia shores, to the north of the blockaded Gaza Strip. The Israeli occupation navy confiscated a Palestinian fishing boat and interrogated the fishermen. The attack is another chain in the series of Israeli violations of the Cairo-brokered ceasefire deal struck in the wake of the 2014 summer offensive on the besieged coastal territory of Gaza. A number of Israeli military vehicles invaded, on Sunday at dawn, the al-Far’a refugee camp, in the West Bank district of Tubas, shot and injured one Palestinian, and kidnapped another. The soldiers surrounded the refugee camp before invading it, and clashed with many local youngsters, who hurled stones and empty bottles at the military vehicles. The soldiers fired many live rounds, wounding one Palestinian identified as Mohammad Walweel, in the shoulder, before he was moved to a local hospital suffering moderate wounds. The soldiers also stormed and searched a number of homes, and kidnapped a young man, identified as Moath al-‘Aaydi. 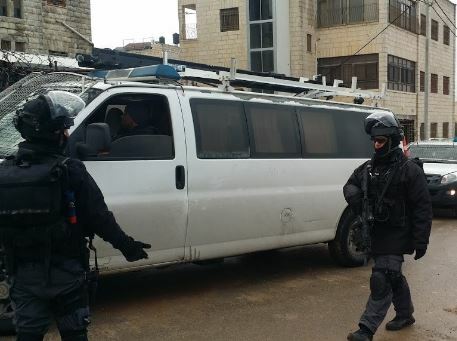 The Jerusalem office of the Palestinian Prisoners’ Society (PPS) has reported that Israeli soldiers have kidnapped twelve Palestinians during extensive military invasions and searches of homes, in different parts of the occupied district. The PPS stated that the soldiers invaded, on Sunday at dawn, Hizma town, northeast of Jerusalem, and kidnapped two young Palestinian men, identified as Fayez Mohammad Sbeih and Luay Hani Sbeih. The soldiers also invaded the towns of al-‘Eesawiyya and Jabal al-Mokabber, and clashed with dozens of local youths who hurled stones and empty bottles at the military vehicles. Undercover soldiers also infiltrated into the al-‘Eesawiyya, and kidnapped three young men, identified as Mohammad Ashour Obeid, Ali Obeid and Mohammad Yousef Ateyya. Regular army units invaded the town and fired many gas bombs, concussion grenades, and rubber-coated steel bullets. 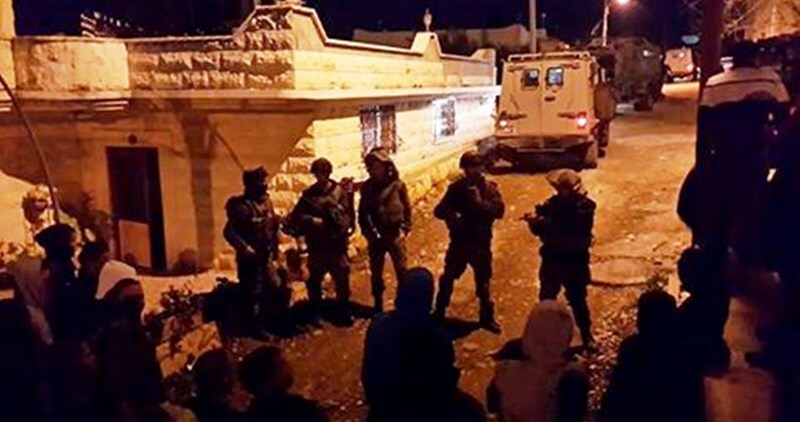 On Saturday evening, the army summoned six Palestinians for interrogation at the al-Maskobiyya interrogation center, west of Jerusalem, and abducted them, just as they arrived there. They have been identified as Ali Oweisat, Fares Oweisat, Mahmoud Oweisat, Adnan Oleyyan, Mojahed Abda, and Obeida Abu Adham.